FEMME FATALE AIRSOFT IS A FINALIST IN THE 7TH POPULAR AIRSOFT PLAYER CHOICE AWARDS! So today I got a pretty awesome surprise! 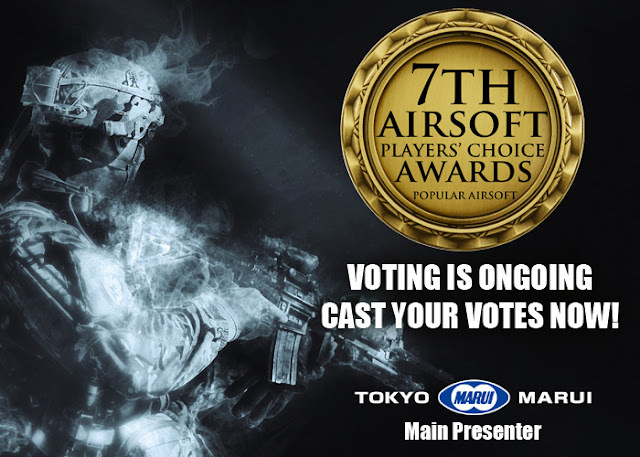 Whilst I was sat at my desk eating a sandwich on my lunch hour, I checked my phone to see that for the second year running Femme Fatale Airsoft has been nominated for 'Best Airsoft Blog' in Popular Airsoft's Player Choice Awards! Now this time around I didn't campaign for this nomination which makes it even more surprising - thank you all for your nomination! SLAYDIES SERIES SPOTLIGHT! SAMARA FERRIE! NEW YOUTUBE UPLOAD! STRIKEFORCE CQB WALK AROUND! SLAYDIES SERIES SPOTLIGHT: SUZI TOOLE! SLAYDIES SERIES SPOTLIGHT! LINZI HORN/LINZI_H_X! FEMME FATALE AIRSOFT YOUTUBE CHANNEL 2017 UPDATE!